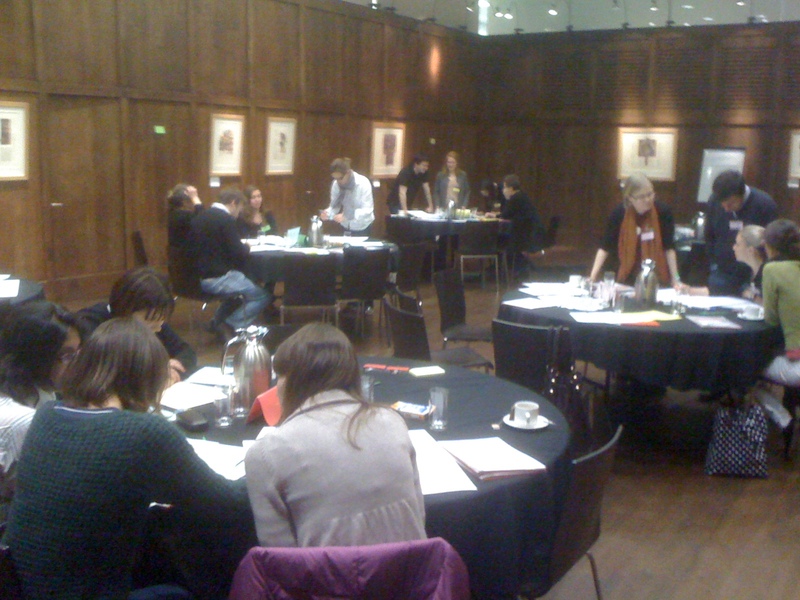 Part of my role at the LSE that I really enjoy is working with staff to find novel solutions to age-old problems. So a few weeks ago I was invited to discuss with colleagues in a research and teaching 'cluster' within a department that perennial question: "what's the point of an away day?" The head of department appeared to want the staff to spend the day writing serious funding proposals and yet a survey of the staff suggested they wanted to "have fun, and get to know each-other." The away-day became a half day and the focus remained a little vague. The fixed points were lunch at noon, a gastro-pub at 5pm, and those apparent polar opposites, 'research applications' and 'fun'. The result was an off-campus half day at St Martin in the the Fields, in the newly refurbished St Martin's Hall. I had organised a 'research-poster workshop', in which tables of 4 or 5 colleagues, of different grades, backgrounds and discipline focus (socially engineered by the departmental manager), worked from a 'mock' European Journal funding call. The funding call, which modelled the 'real thing', invited applications for 12-24 month projects to build research networks with at least three country partners and a particular discipline focus. There was a specification about dissemination, use of technology and so on. The session ran along lines similar to the 'World-Cafe' concept. So each table had to come up with a draft idea, blu-tac their A2 poster to the wall and then circulate around the other four groups' posters providing feedback in the form of post-its (colour coded for each group). The second session then allowed groups to revise their posters, go around and ask for clarification on any feedback received and produce a 'final' version of their research network proposal. All the while, the groups had a copy of the 'marking criteria that would be used at the end, by them, to judge each-others efforts. Final posters were put up and the groups circulated 'marking' the submissions. Each group had to come up with an agreed mark for each of the posters under some time pressure. As the 'very light touch' facilitator I went around between each round and photographed the posters, and I threw in a 'red-herring' with an envelope for each group suggesting a rumour that "The DG apparently likes.....". and that it is possible to have fun and still talk about research funding applications! The feedback was gratifyingly positive and I'd suggest it's an excellent model for a half-day workshop that recognises the need for junior staff to benefit from the experience of more seasoned researchers whilst bringing creatively and innovation to the process. It was also fun! 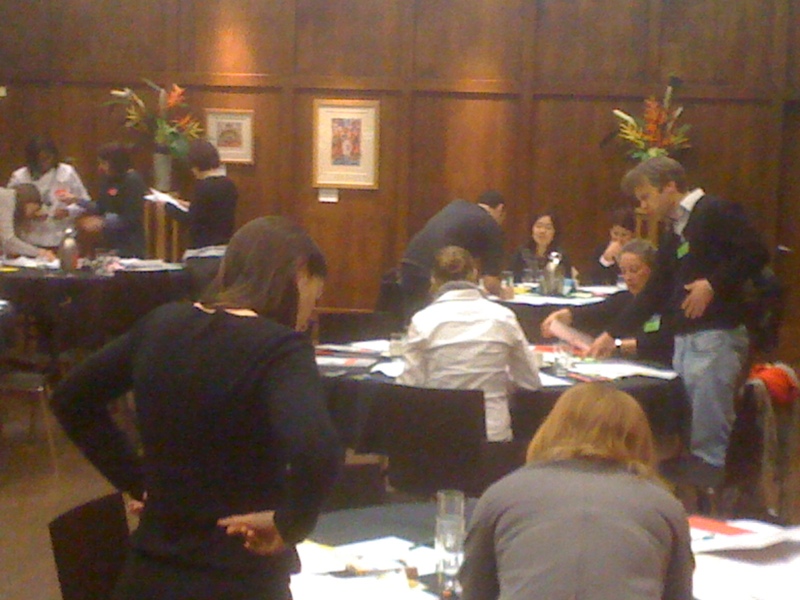 Any workshop where people willingly stand-up and start moving is good to see!